The key theme of The Second Best Exotic Marigold Hotel, the follow-up to 2012’s surprise hit of a crowd-pleaser, is expansion. Whether it’s figurative or literal, the clear aim by director John Madden and writer Ol Parker – both of whom return along with (almost) the entire ensemble of Britain’s finest acting veterans – is not to stick within its foundations but rather build on top of them. In doing so, they provide a sequel that will enchant fans of the original but won’t do much for those who weren’t that keen to begin with. The advantage of having pretty much everybody back is that it certainly feels more like a continuation of these characters’ stories rather than a simple rehash, which so easily could have been the easy way out though it certainly wouldn’t have made any sense at all. It’s still the same group of people that audiences rooted for three years ago, and not much has truly changed other than an additional few wrinkles. Once more, it is them that truly carry the picture; all the performances are wonderfully serviceable, with Maggie Smith being a consistent highlight while Richard Gere, as one of the few new faces arriving on the scene, leaves the bigger impression out of all the arrivals. However, that’s not to say all the players are given enough room on their return check-in – Judi Dench, clearly designated the “lead” in the first film, is here relegated to a supporting part with perhaps the least screen-time out of the lot though she shines as ever, while Bill Nighy makes the most out of a stretched-out romantic storyline that reinstates the “will-they, won’t-they” arc they encountered before. In addition, there’s no real reason for Penelope Wilton, who stood out as the bitter wife of Nighy’s character previously, to feature here other than the fact that she a) made such a strong impression first time round, and b) to complicate and prolong the aforementioned romantic arc. Regardless, all returning players are given the opportunity to build and expand on their characters right from where we left them, though as it turns out not many of them have anywhere to really go at this point. The problem is that the first film ended on more of a satisfying note, placing characters in situations that felt fitting to their emotional arcs that differed greatly to where they were to begin with. That, more than anything, makes this feels a little like an extended epilogue rather than a true continuation – Dench’s Evelyn and Nighy’s Douglas have not yet acted on their obvious attraction to one another, as was highly hinted at during the first film’s closing moments, while Celia Imrie’s love-lusting Madge (“Lordy-lord have mercy on my ovaries,” she exclaims upon meeting Gere’s silver-fox author) continues to explore her options with a handful of suitors at an exclusive club. Some of the newer plot threads conjured up seem to have escaped drafts of failed sitcoms, such as Ronald Pickup’s Norman inadvertently ordering a hit on his girlfriend Carol (Diana Hardcastle) with hijinks not far behind. Speaking of sit-coms, the main storyline this time round – Dev Patel’s hotel owner Sonny facing pressure from his hotel expansion dreams, his own brothers, and the arrival of a mystery hotel inspector in the lead-up to his wedding to Tena Desae’s Sunaina – has its own shades of familiar tropes that wouldn’t be entirely out of place in an episode of Fawlty Towers. A mix-up of identities and a combination of stress from all sides is something that wouldn’t be out of the ordinary for Basil Fawlty, not the owner of a Jaipur hotel that we met in the last film. There’s just not as much drama as there could have been, and whatever parts are reserved for quiet conflict don’t arouse as much interest as it did the first time round. For the audience that it was made for, however, it will certainly resonate as the first film did – the India backdrop still looks gorgeous, and there is a lot of good-natured charm to be delivered by its strong ensemble cast. 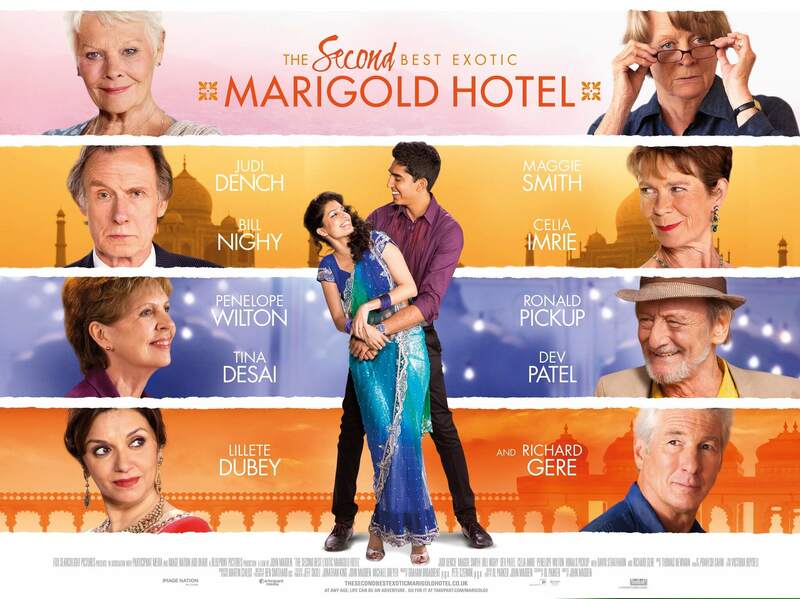 However, if The Second Best Exotic Marigold Hotel was meant to build and expand on what foundation there already was, there just isn’t much grounds for expansion in the first place.